Our Arizona state approved continuing education courses give water operators critical knowledge on a number of topics ranging from pipeline installation to disinfection of water. In addition, these courses will help water operators and wastewater operators complete the required number of continuing education units (CEUs). What are the requirements to renew an Arizona water operator certificate? Complete a total of 30 Professional Development Hours within your 3 year renewal period, regardless of the number of certificates you hold. Fill out and submit the ADEQ's official Operator Certification Renewal Application and include the appropriate renewal fee with your renewal application. Allow time for ADEQ to process your application. You can use the official certified operators database search tool to check on the status of your license. 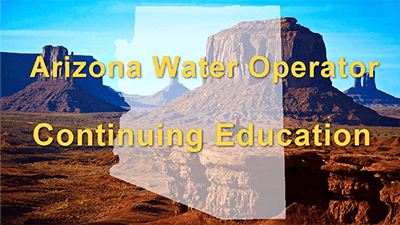 Our online courses and packages will meet all of your continuing education requirements for the state Arizona's water operator and wastewater operator certification renewals. Save on our 30 Hour CE Package! Includes: Surface Water, Source Water, Coagulation, Disinfection, Corrosion, Oxidation, WD Overview, Pumps, Basic Electrical, Wells and Much More. Save on our 22 Hour CE Package. Includes: Water Distribution System Operation Overview (4.5 Hours), Pipelines (3 Hours), Meters, Valves and Hydrants (3 Hours), Pumps and Motors (2.5 Hours), Storage Tank Facilities (2 Hours), Basic Electrical Concepts for Water Operators (2 Hours), Groundwater Wells (2.5 Hours), Distribution System Water Quality Issues (2.5 Hours). Save on our 21 Hour CE Package. Includes: Surface Water (3 Hours), Source Water (2.5 Hours), Coagulation (3 Hours), Sedimentation (3 Hours) Disinfection (2.5 Hours), Corrosion (3 Hours), Oxidation (2 Hours) and Membrane Processes (2 Hours). RE: Operator Certification Educational/Training Program. Course approval for training of, AT Your Pace Online Training Program from the Operator Certification Educational/Training Program for Professional Development Hours from the State of Arizona Operator Certification Program. Thank you for submitting your course curriculum, with attached course descriptions. The information that you provided meets the state program criteria for approving professional developmnet hours. A professional development hour (PDH) is equal to one contact hour of continuing education. A total of 30 progressional development hours are required for each 3-year renewal period regardless of the number of certificates that are held by an operator. "Professional development hour" means one hour of participation in an organized educational activity related to engineering, biological or chemical sciences, a closely related technical or scientific discipline, or operations mangement. 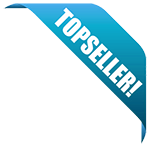 Consider this letter the approval for PDHs issued for this training, which can be used by State of Arizona Certified Operators for renewal of certificates. Approval for Contact Hours does not imply State of Arizona Operator Certification Program endorses or authorizes the training event or organization. You may state that Contact Hours will be accepted by State of Arizona Operator Certification Program for recertification, but you may not use State of Arizona Department of Environmental Quality logo or name in any other way without written permission from State of Arizona Department of Environmental Quality. Please contact State of Arizona Operator Certification Program with any changes to the original training program such as date changes or additions, instructor changes, or content revisions. Please contact me if you have any concerns or questions, thanks Bill.